A control panel is a crucial part of webhosting, it enables you to easily maintain and control all your hosting services. Running a website must be efficient and user-friendly, this is where a control panel plays an important role. There are a number of dominant players on the market: DirectAdmin, cPanel and Parallels Plesk panel. Each control panel has its own unique specifications and (dis)advantages. Let’s take a look at all three of them and compare them with each other. 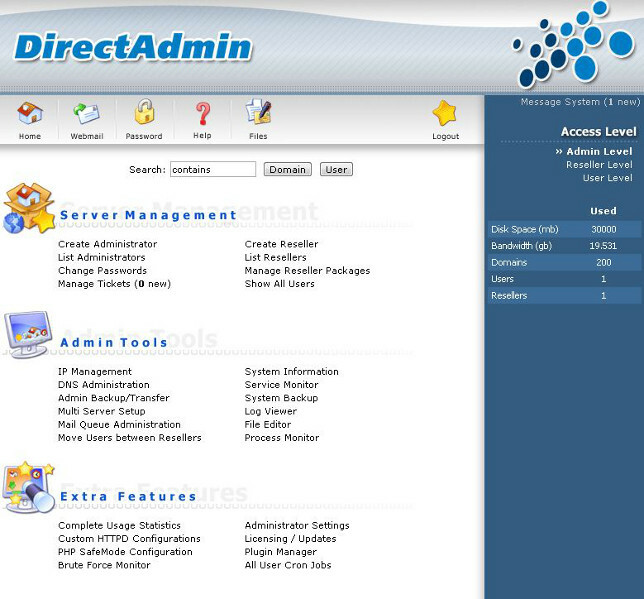 DirectAdmin is a very popular control panel among users, and was founded in 2003 by JMBC Software. The UI is fluent and it looks very neat, but it needs some time get used to it. The control panel is fairly light and it is excellent for both less demanding and high demanding servers. As for the the pricing, SnelServer.com offers a package with unlimited domains for a monthly price of € 5. Supports the following operating systems: Ubuntu, Debian, FreeBSD, CentOS, Red Hat (Enterprise) and Fedora. cPanel is a Unix-based system, just like DirectAdmin. The original version of cPanel was created in 1996, this control panel is still very popular among many users. cPanel was also the very first on the market, it was launched years before any competition. The user interface has a perfect design, and it is classified logically. Moreover, the control panel has more useful features than DirectAdmin and Parallels Plesk Panel. Unfortunately, the price tag is a little bit higher. SnelServer.com offers an unlimited package for € 28 a month. Supports the following operating systems: CentOS, Red Hat Enterprise, FreeBSD and CloudLinux. cPanel also offers support for the following virtual environments: KVM, Linux-Vserver, Microsoft Server 2008 Hyper-V, Open VZ, Oracle VirtualBox, Virtuozzo, VMWare and Xen. Parallels Plesk Panel is often considered as a simple, yet good control panel solution for Windows servers. The control panel was released in 2003. The user interface is very clear and stable, this makes Parallels Plesk Panel very popular. Hence, it is one of the biggest players in the industry. Parallels Plesk is the only control panel with native support for Windows Server 2008 and Server 2012, which is definitely a unique selling point. SnelServer.com offers different packages, starting at € 6 for 10 domains per month. If you need more domains, for example a hundred domains, you’ll pay € 15 per month. But you can also order an unlimited package for € 29 a month. Supports the following operating systems: Debian, Fedora, FreeBSD, Red Hat (Enterprise), SUSE, Ubuntu, Windows Server 2003, Windows Server 2008 and Windows Server 2012. Which control panel is the best choice for you? DirectAdmin, cPanel and Plesk all have their own advantages and disadvantages. We think that DirectAdmin is a great choice for smaller hosting projects. This control panel has enough possibilities and it is available at a good price. If you need an extensive control panel for Linux servers, then cPanel could be perfect for your needs. But if you prefer to work with a Windows server or a very clear user interface, Parallels Plesk would be the best way to go. During the generator maintenance, SmartDC will have another generator available and will be able to supply the full load of the datacenter facility. The testing is planned to test and confirm all emergency systems operate correctly during an actual, non simulated, electrical utility disturbance or failure. The A-feed will not be impacted as their redundant UPS and Generator systems will support the full load during the test. As their B-feed is not behind the UPS, this one will be down until the generators supply the full load. Also the lights will flicker during the transition to generator of up to 30 seconds. Emergency lightning will be available continuously. Should you have any questions regarding the planned maintenance of SmartDC please open a ticket or send an e-mail to support@snelis.com.